If they haven’t already, New Hanover County homeowners should be receiving their 2017 tax revaluations, the first since 2012. The delivery of the revaluations makes this a good time to touch upon a topic that we’ve discussed in the past – a home’s tax value vs. its market value. Do you know the difference? When it comes time to list their home for sale, many owners are surprised to see that the listing price is not the same as the property’s tax value or tax assessed value (TAV). When a government (county, municipality, city, etc.) levies property taxes, it’s based upon a tax assessed value determined by an assessor. The tax assessor does not usually enter the home, but does visit the property and compares data from past years. The end result is usually a percentage of the total market value; however, there are occasions where the tax assessed value is more than the market value. The reason why can vary from location to location, but in New Hanover County it may be linked to when the home was assessed. New Hanover County completes revaluations every 4 years and will only look at comparables from the year the assessment was completed. Market values can change year-to-year; so if a home is located in a neighborhood that was selling great the year it was assessed, but sales drop the next two years, the owners could find that their tax assessed value is less than the market value. Market value or fair market value (FMV) is how much the home is likely to sell for in the current market. It’s determined by looking at other similar homes that have sold in the same area and relies on multiple factors, including number of bedrooms, number of baths, garage size, age of the home, heated square-feet, condition, location, and more. The more features the home has that appeal to buyers, the higher the market value. It’s good ole supply and demand. Now, to confuse things even more, there is an appraised value. 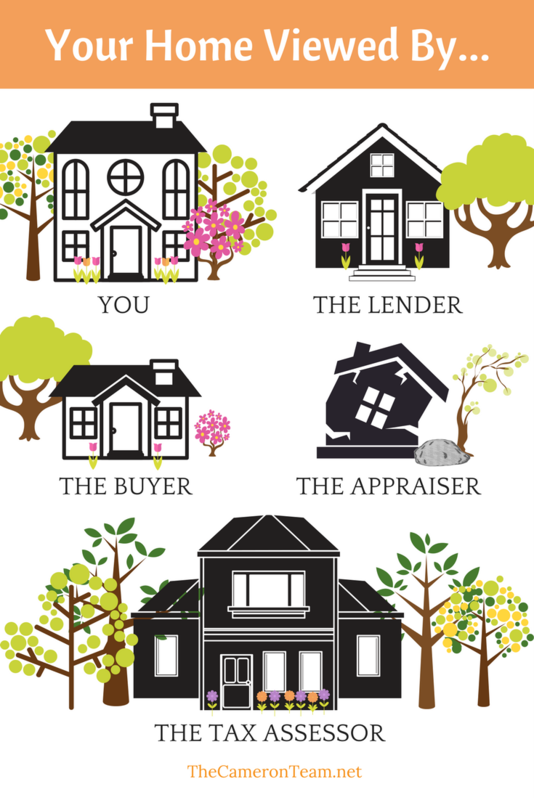 This is a value determined by a state licensed appraiser, and usually comes into play when and if the buyers need to finance their purchase. The appraisal assures the bank that the investment will be sound. Technically, this should be the same as the fair market value. However, appraisers are human beings and, like all human beings, they put their own weight of importance on different values. So, there’s always a chance that the appraised value will come out differently than the pre-determined fair market value. If it’s less than the assumed fair market value, the purchase price will need to be renegotiated to get the bank to approve the loan. Going back to the delivery of the revaluations in New Hanover County…. Residential properties were scheduled to receive theirs mid-February with commercial properties due to be mailed by March 1. For the past 2.5 years, appraisers have been working to visit all 104,000+ parcels of land in the county. To assure accuracy, home owners were also sent questionnaires. The last evaluation was done in 2012 and is now scheduled to happen every 4 years.